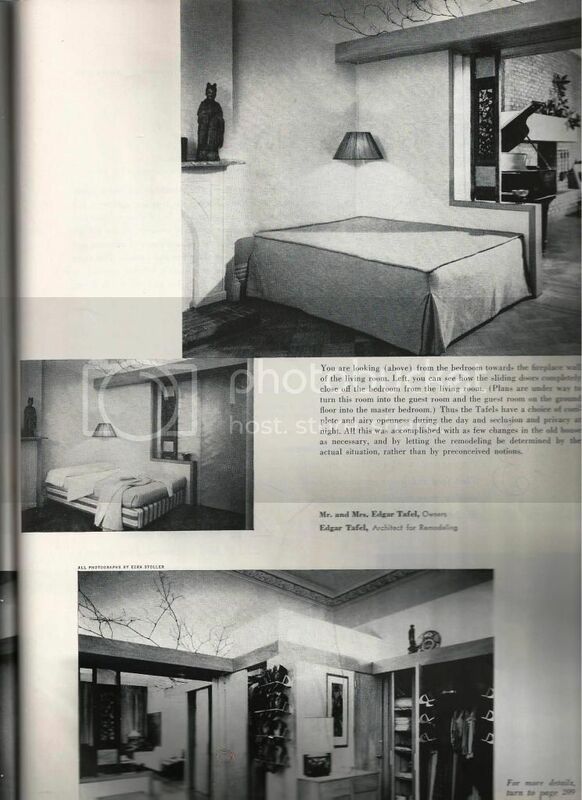 I purchased the September 1954 issue of House Beautiful. 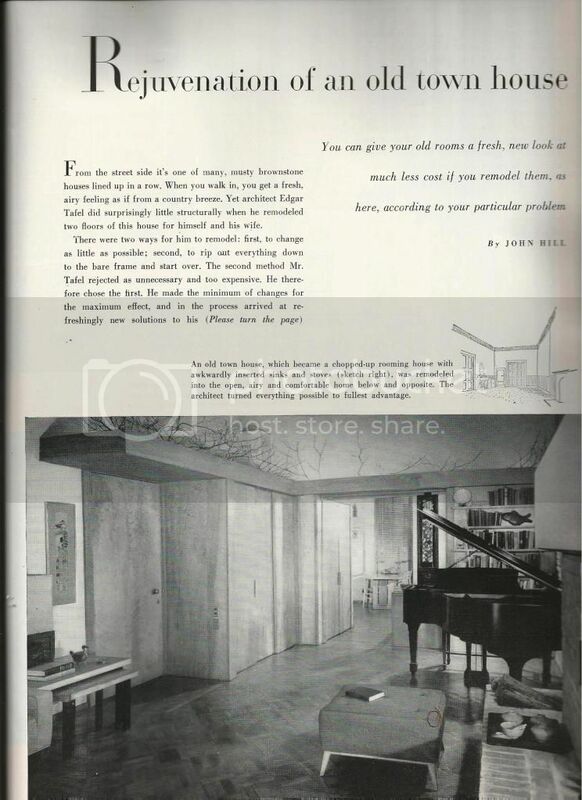 It contains a fascinating article on the apartment renovation of Mr. and Mrs. Edgar Tafel. In a Victorian-era townhouse, Tafel inserted a Wright-ish sensibility that stops short of the original elaborate cornices. Note how the new bathroom cube interrupts the square geometry of the room, while respecting the square ceiling plane. Nice. Oddly, the two floors do not directly connect. Tafel is quoted as saying he planned on converting the lower unit into a master bedroom. Did he connect the units, I wonder? I�m dying to know if this apartment is still intact. You just know that someone much later purchased the place, and thought: WHO did this awful work to this wonderful old apartment! What an incredibly neat "intervention". I can't get over how well this actually appears to work. The Victorian elements of base, cornice, and trim are painted out as background and the new weaves its way within to become the foreground. You are right ross, unless this stayed in Tafel's hands to the end, it was probably undone at some point. Yes, I really like it, too. I think Tafel did an excellent job, and the work still looks good today. I could live there, no problem. How does one access old telephone books? That would give us the address. From there, a letter to the house, with article enclosed, might confirm if the work is extant. How does one access old telephone books? "Between the Lions"...The New York Public Library probably has them, possibly on microfilm or microfiche. Otherwise, a local historical society might be able advise where old phone books or city directories might be found. Last resort would be Tafel's papers which I believe were donated to a university, possibly the Avery Library at Columbia....somebody correct me if I'm mistaken. Fantastic. Nice work with the desk/radiator/stereo. It's interesting to see Wrightian principles working well with historic elements like the parquet floors crown, Victorian fireplace, and crown molding. He used the high ceilings to great advantage. Interesting how Tafel used the radiators to advantage ... to grab Victory from the Jaws of Defeat, long a Taliesin Tradition. 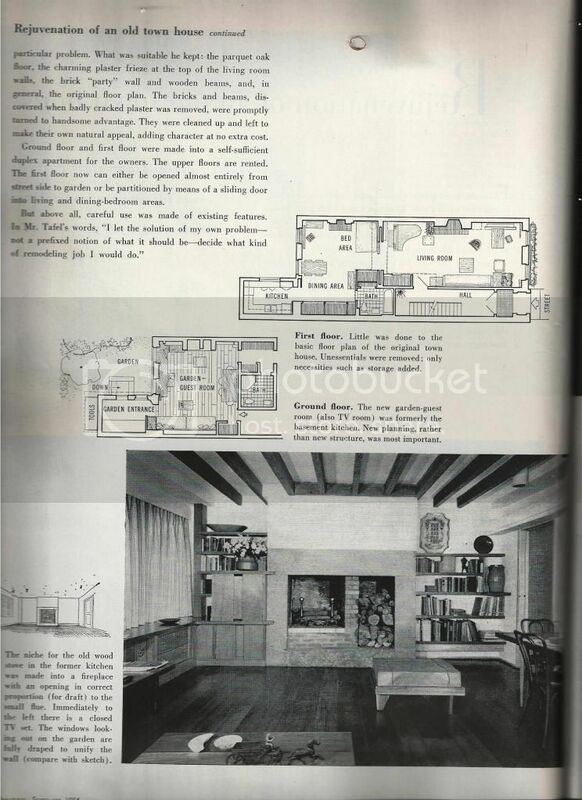 Mr. Wright's early houses, of course, had radiators cleverly concealed behind wooden structures, until in the mid-30's he finally submerged The Willey living room radiators below floor level, until completely enclosing them within the concrete floors of the Usonian Houses. 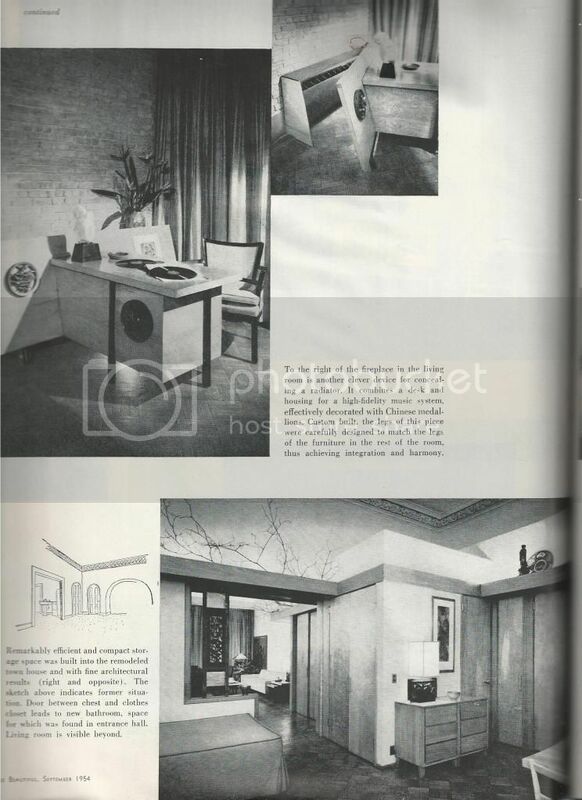 Perhaps John deKoven Hill's New York apartment remodel was even better than Tafel's. A couple of colour photographs in a later House Beautiful illustrated his effort to good effect. Curious though. At the same time Tafel was hiding his radiators ... I was faced with a similar problem, after my parents moved us to a new/old house in the 50's. My bedroom had one tall, ugly radiator clumsily set between two windows. Topping it with a long, narrow board, I raised another, smaller piece of plywood in front of the radiator, just four inches off the floor. From that I leaned a larger panel against the radiator, the top edge of the panel hidden just beneath the narrow board above. The larger panel formed a perfect easel for the display of art works, photographs, and such, while the lower board periodically held a shiny brass bowl filled with fresh fruit. Though incredibly inexpensive and simple, the ensemble made the room sparkle with vigour and verve. A similar problem faced me when I moved into the top floor apartment overlooking the lower court at Taliesin. A few pieces of Cypress boards, cut to size, perfectly concealed the room's radiator, again providing a handy easel for display. Combined with several new shelves built into the blank wall below the long line of windows, plus a folding screen set beneath a newly abbreviated deck, the whole replacing a door so heavy its hinges were torn from the wall, and the tiny room was transformed into something rather restful and pleasing. So effective were these two efforts that I recently built a somewhat similar but far more sophisticated arrangement in my home office ... again between two windows (minus the radiators). It's all a bit like Mapplethorpe's signature altars ... a feature of all his apartments from first to last. Anyone ever seen Mapplethorpe's New York apartments? Fascinating affairs ... he apparently had a great feel for architecture. The New York address I have for Edgar Tafel, going back to the early 80's when we first began exchanging letters, was 14 East 11th Street. I have no idea if that address though is the apartment in the article. Thank you Randolph. Through the wonder of the Internet, I just did a Google "walk" in front of 14 East 11th Street. There are two identical townhouses side-by-side. I also "flew" overhead. Each townhouse matches the Tafel plans shown above (location of front windows, front door, stoop, etc. ), including the rear extension. It would seem that one of these townhouses is the likely candidate. Anybody live nearby? I wonder if an evening walk would reveal anything through the windows (one of my favorite pastimes when I lived in the city)? In 2006, Tafel gave $3.2 million to Cornell University's Department of Architecture to endow the Edgar A. Tafel Professorship in Architecture and the Tafel Architecture Lecture Series (from Wikipedia). Tafel, of course, died in January 2011. Was he still at 11th Street in 2011? And is 11th Street the same as the 1954 apartment? Thank you Craig. I think that would confirm that Tafel was still at 11th Street when he died last year. The question is: is 11th Street the same place as shown in 1954? And is it intact? I would love to know. "The house, located at 14 East 11th Street, is currently vacant as the current owner has started the demolition process." 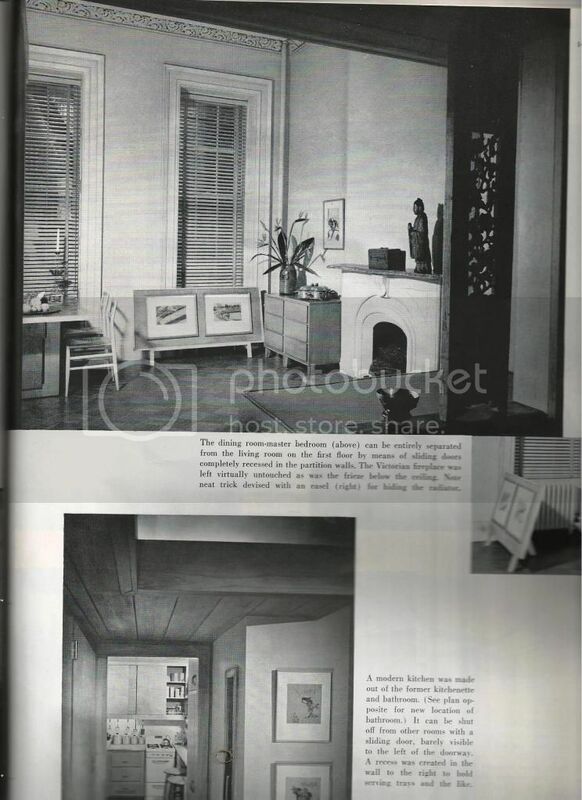 14 East 11th Street is, indeed, the Tafel residence, and is the same as pictured in 1954. The plans below confirm that the 1954 Tafel renovation was still intact, at least recently. Is it still? In the Google Maps street view of the address, the number 14 can be read on a white block to right of the front door, the brick is painted a deep green color, and a blade sign is mounted to the wall which reads "Townhouse for Sale". Not sure of the date of the picture...it is a summer view. The house sold last year for almost $8 million. I assume Tafel paid, what, less than $50,000 in the early 1950s? 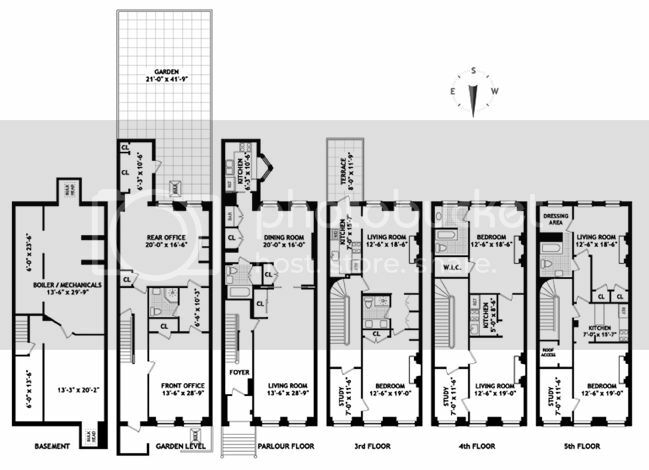 Interesting to see the floor plan. 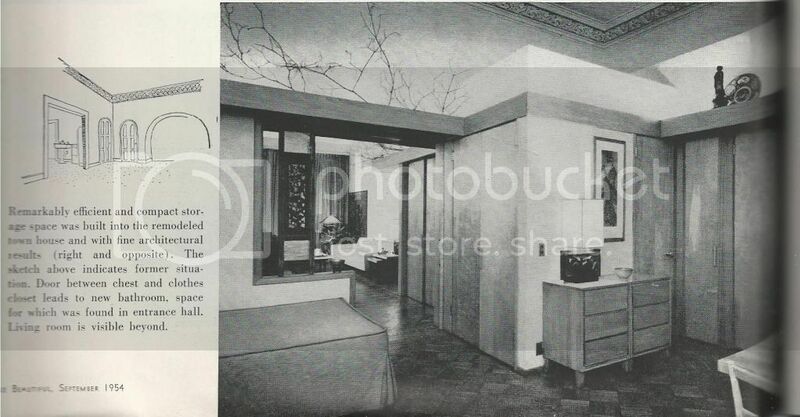 It would seem Tafel owned the building and his "unit" included the Parlour Floor, Garden Level, and Basement. The 3rd, 4th, and 5th floors were each separate apartments, presumably providing him with rental income to offset his housing costs. 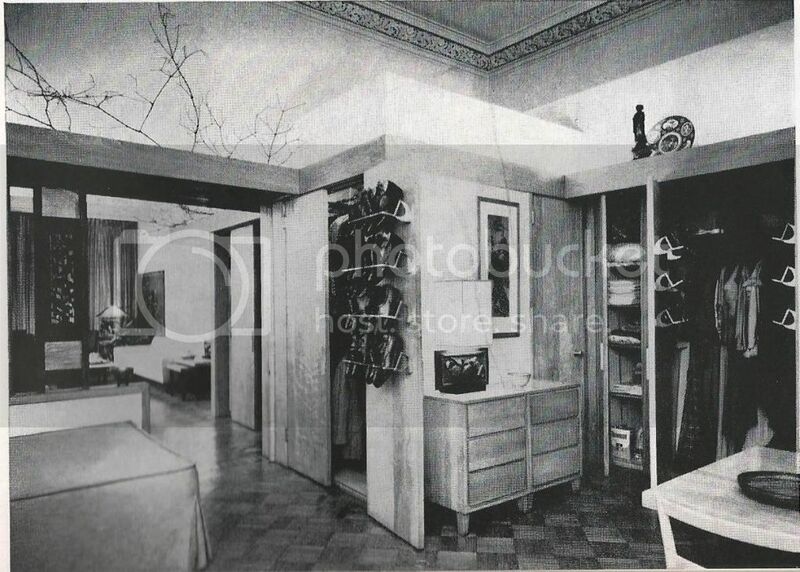 One is led to assume Wright may have visited here when he was "about town" as he did with Edward Durell Stone's townhouse at 130 East 64th Street. It is all but certain Wright would have seen this issue of HB, given his ties to Elizabeth Gordon and John deKoven Hill.